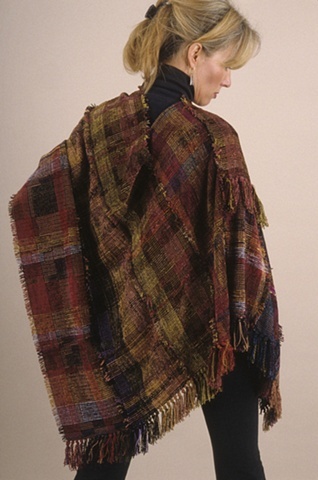 Handwoven poncho of rayon and cotton in 4 harness blockweave. Pieced from 4 different Barbara Holloway fabrics. Each piece unique. One size. Dry cleanable due to the copious amount of fringe. Available in 4 different colorways- Jewel, Playa, Earth and Turquoise.